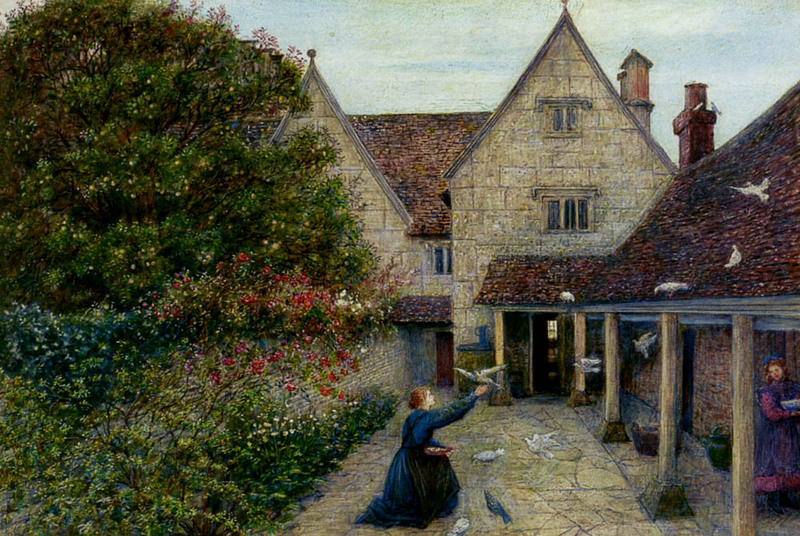 Marie Spartali Stillman (1844–1927), Kelmscott Manor: Feeding Doves in Kitchen Yard (1904), watercolor and gouache on paper, 34.3 × 52.1 cm, Kelmscott Manor, The Society of Antiquaries. Wikimedia Commons. 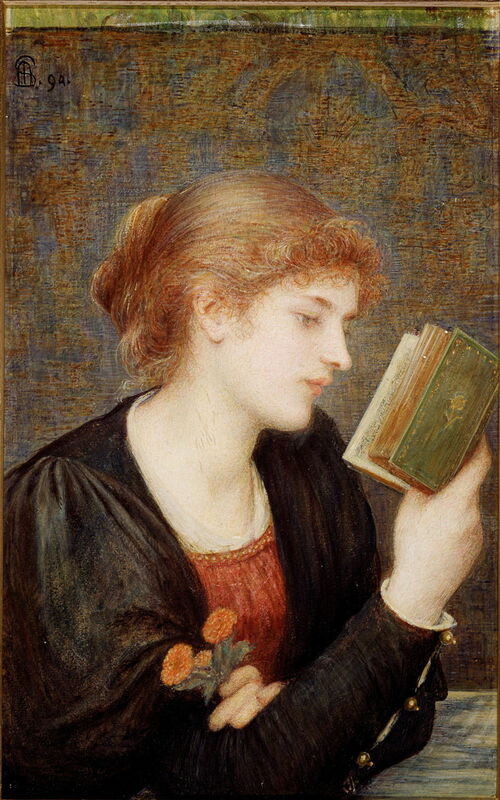 In my previous article, I described the life and work of Marie Spartali Stillman (1844–1927) during some of her most active and productive years. This article completes my account. Late 1892 saw Marie’s step-daughter Bella married after a brief engagement to the Slade Professor of Fine Art at Cambridge University, and director of the Fitzwilliam Museum there. 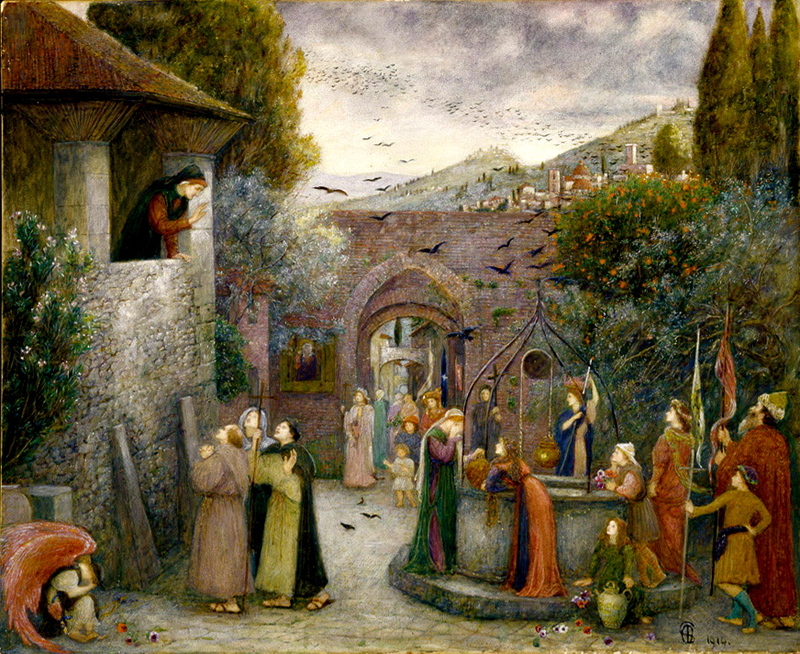 Marie Spartali Stillman (1844–1927), How the Virgin Came to Brother Conrad of Offida and Laid her Son in his Arms (1892), watercolour, gouache, and gold paint on paper, 49.5 × 80 cm, The Mander Collection (National Trust), Wightwick Manor, Wolverhampton, England. Wikimedia Commons. How the Virgin Came to Brother Conrad of Offida and Laid her Son in his Arms (1892) is one of a small group of religious works, of which two were drawn from the legends of the life of Saint Francis of Assisi. Marie loved the Italian text of The Little Flowers of Saint Francis, on which she based them. 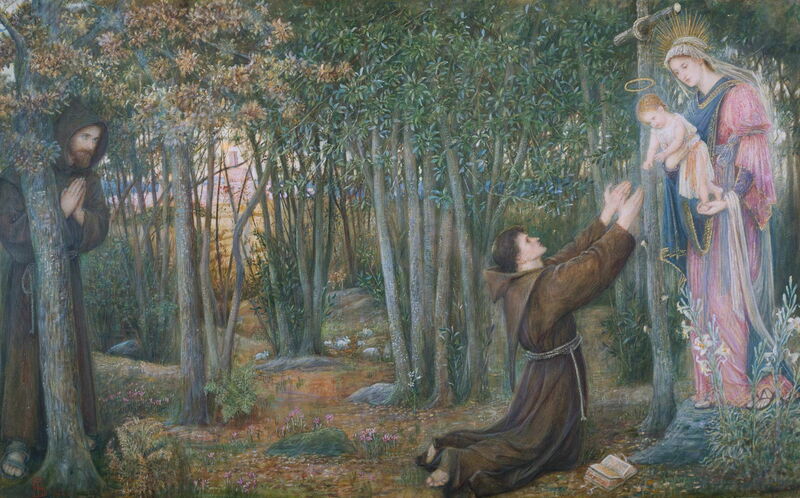 This painting shows Friar Conrad (kneeling), who took himself to a wood to meditate on God, only to experience a vision of the Virgin Mary in response to his prayers to her. His colleague Friar Peter (at the left edge) witnessed this from his hiding-place nearby. Marie’s composition was discussed in correspondence with Edward Burne-Jones, who approved of it, and Marie painted it during the winter of 1891-92, when in Rome. Although too late to be exhibited at the New Gallery, she sent it to Liverpool instead. Its companion, The Vision of the Good Monk of Soffiano (1893), was exhibited at the New Gallery in 1893. In 1893-4, she painted a series of fine Italian landscapes in the company of Giovanni Costa. I regret that I have been unable to locate any usable images of them. Marie Spartali Stillman (1844–1927), A Rose in Armida’s Garden (1894), watercolour and graphite on paper, 64.8 x 43.2 cm, Private collection. Wikimedia Commons. I have already commented that her A Rose in Armida’s Garden (1894) has little narrative as such, although it refers to the Eastern sorceress who is a central figure in Torquato Tasso’s epic Jerusalem Delivered. Unlike the many highly narrative paintings by Poussin and others, Marie chose instead to paint what amounts to an Aesthetic portrait. There is more here than just her beauty, though, as some of the petals fall symbolically off her roses. Exhibited at the New Gallery in 1894, this work was already marked as a wedding gift for a family friend. Marie Spartali Stillman (1844–1927), Love Sonnets (1894), watercolor and gouache on paper mounted on wood panel, 44.1 × 27.9 cm, Delaware Art Museum, Wilmington, DE. Wikimedia Commons. Love Sonnets (1894) was a companion to A Rose in Armida’s Garden, and a simple exercise in pictorial poetry. Shown alongside one another, it was this work which sold to the American Samuel Bancroft, whose support she later cultivated. Marie Spartali Stillman (1844–1927), A Lady with Peacocks in a Garden, an Italianate Landscape Beyond (1896), pencil, watercolor, bodycolour and gum arabic on paper, 42.3 × 43.2 cm, location not known. Wikimedia Commons. 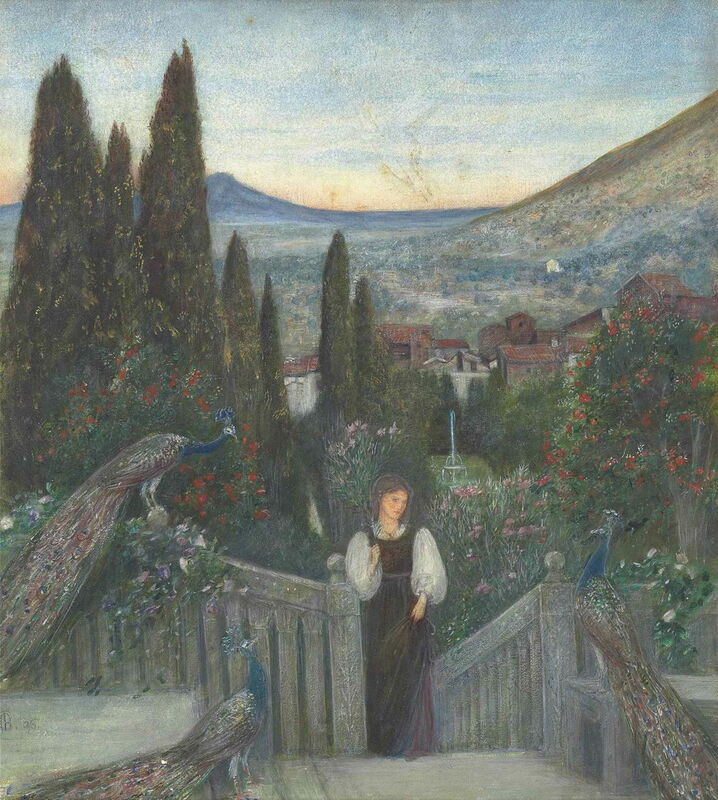 A Lady with Peacocks in a Garden, an Italianate Landscape Beyond (1896) sets the full-length figure of a woman ascending steps, to reach three peacocks, against a superb background of the Italian countryside at dusk. Marie Spartali Stillman (1844–1927), Beatrice (1896), watercolour and gouache on paper mounted on board, 57.6 × 43.2 cm, Delaware Art Museum, Wilmington, DE. Wikimedia Commons. Beatrice (1896) refers to Dante’s Vita Nuova, through Dante Gabriel Rossetti’s popular translation into English. 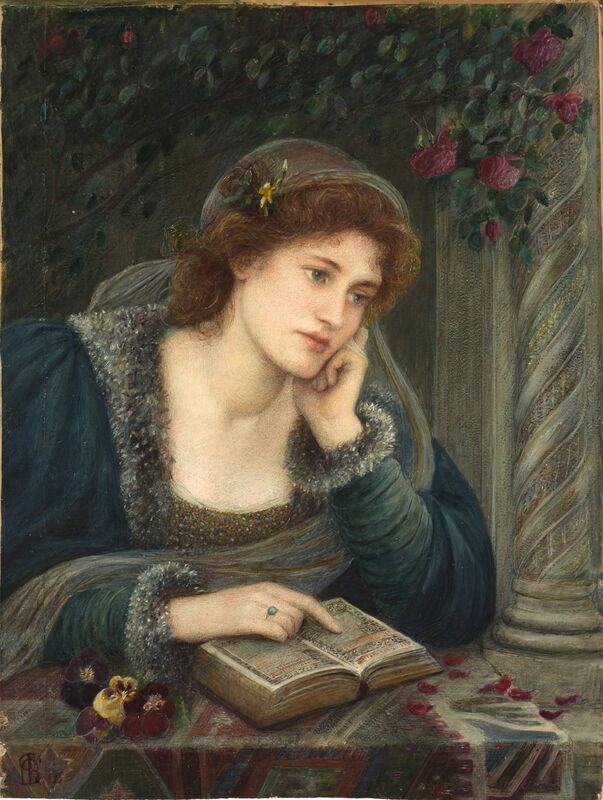 In this earlier version, Marie shows Dante’s beloved Beatrice lost in contemplation while reading, an intimate insight set firmly in the Pre-Raphaelite mediaeval. This was exhibited at the New Gallery later that year. 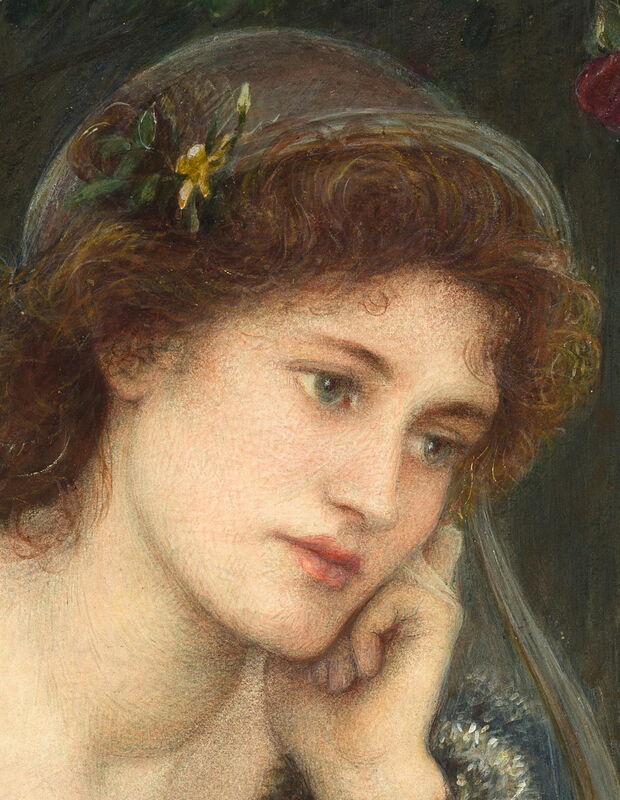 Marie Spartali Stillman (1844–1927), Beatrice (detail) (1896), watercolour and gouache on paper mounted on board, 57.6 × 43.2 cm, Delaware Art Museum, Wilmington, DE. Wikimedia Commons. This detail view of Beatrice provides more insight into her watercolour technique, which better resembles that of oil painting. In 1898, William Stillman finally retired from The Times, allowing the family to move back to England, where they had a woodland house built for them at Deepdene, Frimley Green, Surrey – an affluent and then quite rural area well to the south of London. Marie was better able to put her paintings into the UK market again, and renewed her visits to Kelmscott Manor. However, sales of her paintings were slow. Marie Spartali Stillman (1844–1927), Beatrice (1898), watercolour, gouache and graphite, 54.6 x 36.9 cm, Private collection. Wikimedia Commons. 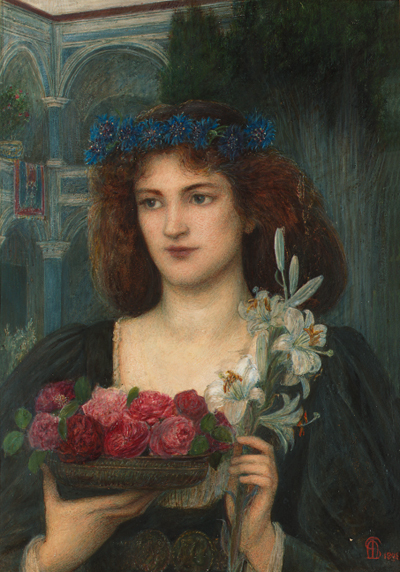 Marie’s second treatment of Beatrice (1898) employs similar floral language, perhaps emphasising innocence in its lilies, but is less contemplative and more sensual, in a manner more typical of Rossetti, perhaps. 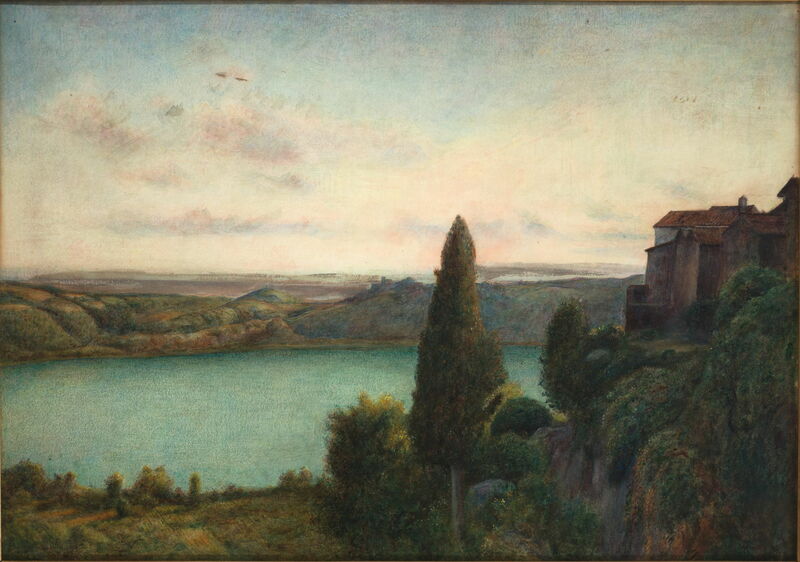 The Lake of Nemi (1899) is one of the many superb landscapes which Marie painted during the 1890s. This is a small circular lake to the south of Rome, which has been a popular motif for painting. JMW Turner visited the lake on several occasions, sketching it extensively in 1819, and painted it at least five times, from different points of view. Marie’s husband died in 1901; her step-daughter Bella’s husband had died in 1896 (at the age of only 49, following an accidental overdose of morphine), so the two moved to live together in Kensington, London. Marie took both step-daughters for the summer to Rome in 1902. The following year she visited the US, where she spent time with Samuel Bancroft, who had purchased Love Sonnets in 1894. 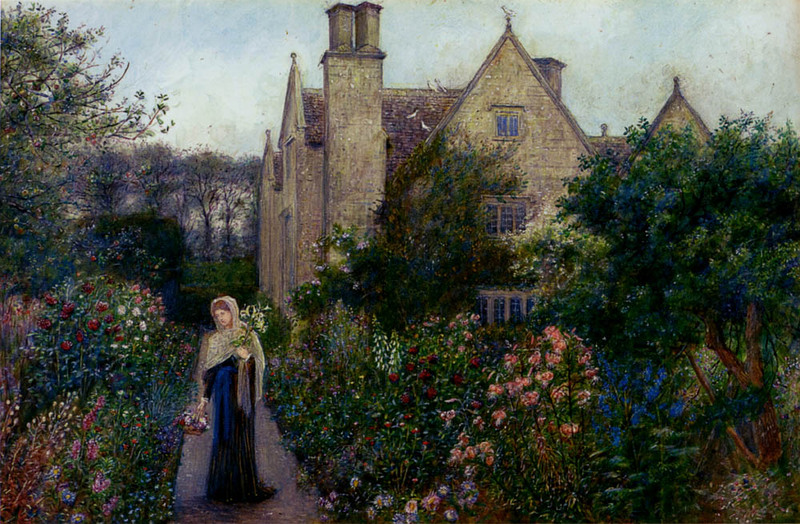 Marie Spartali Stillman (1844–1927), A Lady in the Garden at Kelmscott Manor, Gloucestershire (date not known), pencil and watercolour heightened with bodycolour, on Whatman watercolour board, 27 × 36.8 cm, location not known. Wikimedia Commons. 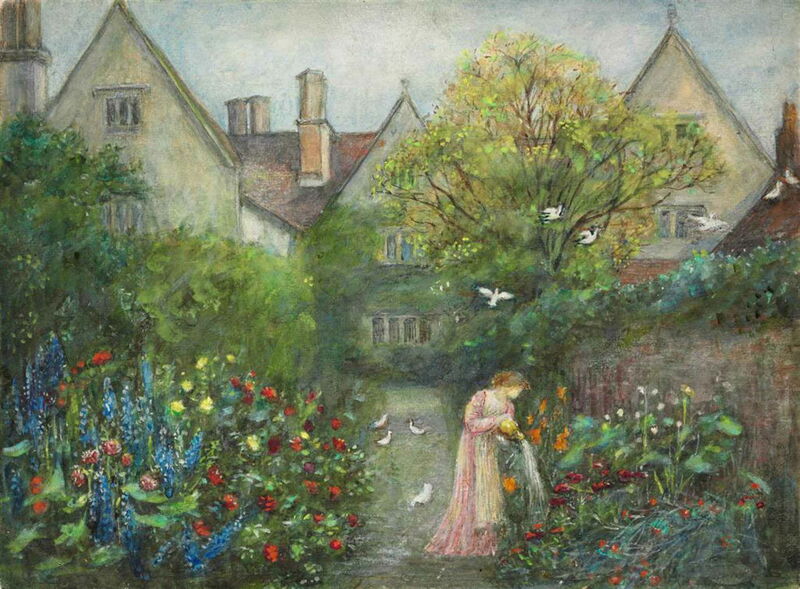 Marie painted many views of Kelmscott Manor, which was the residence of William and Jane Morris, and a centre of the Arts and Crafts Movement at the time. Her A Lady in the Garden at Kelmscott Manor, Gloucestershire is undated, and could have been painted rather earlier. The Manor was originally built in stone in about 1600, and nestles in countryside near the River Thames, to the west of Oxford. Among its many features is a walled garden, which Marie found particularly secluded and peaceful. Kelmscott Manor: Feeding Doves in Kitchen Yard (1904) is possibly her finest view of the house, with a woman on one knee on the crazy paving slabs, her right arm held up to feed one of the white doves from its flock. Marie’s rendering of the different textures of the stone and tiles is painstaking and highly effective. Marie Spartali Stillman (1844–1927), Kelmscott Manor: The Long Walk (1904), watercolour and gouache on paper mounted on backing, 38.1 × 54.6 cm, Private collection. Wikimedia Commons. Kelmscott Manor: The Long Walk (1904) is another wonderful view of the house. The woman shown is clutching lilies in her left hand, as a symbol of purity, and her head is covered as if she was from mediaeval times, not the early twentieth century. Marie returned to the US in 1908, where a solo exhibition was held in New York. Marie Spartali Stillman (1844–1927), The Pilgrim Folk (1914), watercolor and gouache on paper, 56.8 × 70.3 cm, Delaware Art Museum, Wilmington, DE. Wikimedia Commons. The Pilgrim Folk (1914) may well have been Marie’s last major painting, and is a valediction to Italy, which had influenced her so much. It again refers to Dante’s Vita Nuova via Rossetti, a quotation from which was shown with the painting. This passage contains Dante’s account of Beatrice’s death to a group of newly-arrived pilgrims. Dante leans out from a window at the left, addressing three pilgrims below. At the lower left corner, the winged figure of Love crouches in grief, poppies scattered in front of him. Pilgrims around the well are taking refreshment after their travels, and more are arriving through the alley beyond. Black crows fly in flocks above, symbolising death. The landscape behind is very Italian, and the whole has a fairy-tale unreality about its mediaeval details. This painting was completed prior to the outbreak of war, but was not exhibited until 1919. After the First World War – in which two of her cousins died – Marie resumed painting in earnest, and continued to paint actively until shortly before her death. She visited the US again in 1923, and died in London in 1927. She was probably the last survivor of the Pre-Raphaelite movement. Her obituary in The Times (for which her husband had written so much) seems to have decided her fate in the history of art, though: it dwelled on her beauty, grace, and charm. Its single short paragraph about her art described it as a leisuretime activity. No catalogue raisonné of her work has been attempted, but more than 150 paintings of hers are known or survive, from a career which lasted about sixty years, during which her paintings were exhibited throughout the UK, in France, Italy, and Boston and New York in the USA. 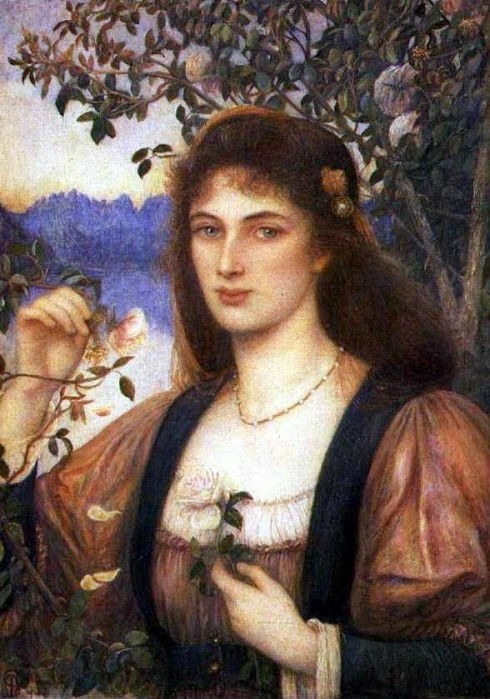 My next and final article in this series will attempt an appreciation of the works of Marie Spartali Stillman, and I will try to cast a little more light on her visits to the Isle of Wight in particular. Delaware Art Museum, in Wilmington, Delaware, has one of the best public collections of Marie Spartali Stillman’s paintings. This compares, for example, with London’s Tate Gallery, which has none at all. Frederick MS & Marsh J (2015) Poetry in Beauty: The Pre-Raphaelite Art of Marie Spartali Stillman, Delaware Art Museum. ISBN 978 0 996 06761 4. Astonishingly, few other books on the Pre-Raphaelites even mention her, and if they do it is as a model and member of the circle. Posted in General, Painting and tagged history of painting, Morris, painting, Pre-Raphaelite, Spartali, Stillman, women in art. Bookmark the permalink. Thanks for introducing me to Stillman, of whom I’d never previously heard.